Signing in to confirm my continued existence. This last week has been a solid wall of play testing and map making for Africa-land and Dead City stuff, plus my usual gaming obligations. It's got to the point where both groups are on the brink of heading straight into the desert to find the city so I've had to pick up speed as a result. I've continued to chop away at Spears of Dawn until it fits the hole I've set aside for it in my campaign, namely to frame the desert that will house the Dead City. The latest step in this process has been to re-imagine the map. I've tried to stay close to the source material in spirit, keeping most of the names and general spacial relations, but changing bits and pieces as they suit my style (both aesthetic and gaming). The result is quite pretty, I feel. It looks small because it's zoomed way out. If I were to print this it would be about two metres long. So, rather big. From this distance you can hardly make out the rivers or the words, but that's JPGs for you. Click here for the outrageously huge and high quality version. Here's how it all fits together so far. 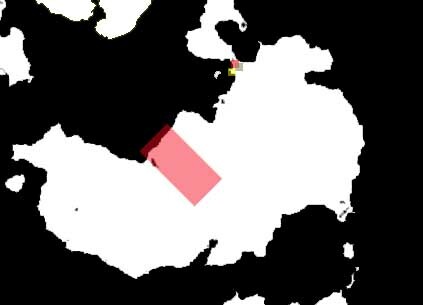 The big red rectangle is the above map overlayed on the world map. See that tiny red square in the top? That's this map. 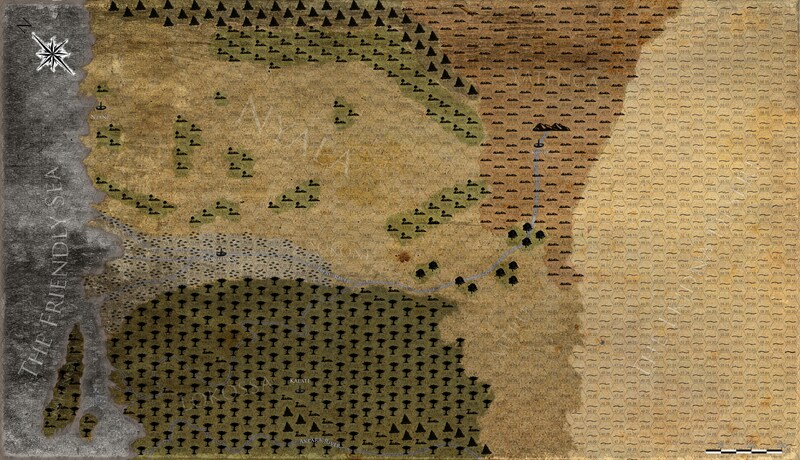 The Three Lands and adjacent Ekidna Desert is rather big in comparison to puny old Vornheim and the Kairnlaws. The desert itself stretches off into the heart of the continent, hiding the Dead City in it's drifting dunes. I'm working on a bigger scale than I'm used to and have so far enjoyed it. Fewer rivers to figure out, no roads to draw, and I can quite legitimately not mark anything other than the largest most important places on the map. When a hex is 36 miles across you can hand wave all sorts of things.